In this episode Jesus expelled the money changers from the Temple, accusing their commercial activities as “a den of thieves”. Another time, Jesus again accused the Temple authorities of thieving, this time naming poor widows as their victims, going on to provide evidence of this in Mark 12:42 and Luke 21:2. 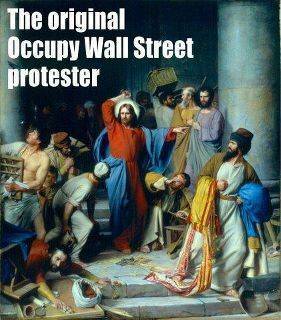 So the spirit and essence of the Wall Street money changers has been around for a long time! Just as a note of interest, in olden days, a local area issued their own coins, often carrying the face of a ruler. When outsiders visited, in this case people visiting Jerusalem from all over the Roman Empire for Passover, it was necessary to exchange their foreign coins to local ones at local money changers who operated in the market place. Money changers would assess a foreign coin for its type, wear and tear, and possible counterfeit, then accept it as deposit, recording its value in local currency. The merchant could then withdraw the money in local currency. After the market closed for the day, merchants gathered at the local money changers and withdrew their deposit in their own different currencies. The rate of exchange between different foreign currencies and the local one were fixed between the opening and the closing days of the market. Anyway, upon arriving at the Temple, Jesus witnessed the pilgrims who came for the Passover being robbed by the money changers in the Court of the Gentiles of the Temple. The money changers were men who were working for the the official high priest, who was the real power in the Temple. The money changers were cheating the people by changing their Roman money into Jewish coins that could be given as a offering in the Temple. The exchange rates offered by the money changers was grossly unfair. Or if the pilgrim brought his own animal to be offered as a sacrifice in the Temple, the priest would turn it down as not being acceptable. The religious pilgrim would then have no choice, but to take it to the money changers who would trade them for a animal that the priests would accept. If the pilgrim needed to purchase a sacrifice he was charged inflated prices. The whole operation was a devised to rob the people and make absorbent profits from the Temple sacrifices. So, Jesus upon seeing these thieves stealing from the people, made a whip of small cords and drove the money changers out. We do not know exactly whether Jesus simply threatened the money changers or actually hit them as they hurriedly split. In His righteous indignation, Jesus also turned over the money changers tables and poured out their money. Clearly, He presented to them a threatening figure and they retreated before Him. Certainly, the money changes reported this incident quickly to the high priest which insensed them against Jesus. Jesus’ motives were pure. Many of the W.S. protesters are being paid to be there, many are very disresptful of the local merchants trying to earn an honest living and many have political motives nazi’s and communists present. Others are even calling for violence. to quote an old song ” when you start carrying pictures of chairman Mao don’t you know you can count me out.” Call me when you have a pure motive. Where do these “facts” come from, Fox News? Can you substantiate such claims? And on what grounds do you claim that the protesters do not have pure motives? P.S. – For the record, Occupy Wall Street is no doubt Fox News’ worst nightmare, and they’re doing everything they can to downplay this movement and distort its message. First of all, some strong words from Elizabeth Warren about why Wall Street is to blame. I would say that Elizabeth Warren has the credentials on the topic. She is a law professor, and US Senate candidate, who served as Assistant to the President and Special Advisor to the Secretary of the Treasury for the Consumer Financial Protection Bureau. In the wake of the 2008-2011 financial crisis, she became the chair of the Congressional Oversight Panel created to oversee the U.S. banking bailout (formally known as the Troubled Assets Relief Program). Seems pretty violent… he did make his own whip. There no hard evidence that Jesus actually hit anyone with the whip, but it would stand to reason that the money-changers weren’t going to take any chances and so departed rather quickly as a result! Guess you could call it an illustrated sermon! This entry was posted on October 21, 2011 at 1:59 pm and filed under Christianity,Occupy Movement,Uncategorized. You can follow any responses to this entry through the RSS feed.